CREC685, the first Chinese air cushion slurry-EPB dual mode shield machine independently developed by CREG (China Railway Engineering Equipment GroupCo, Ltd.), was successfully launched on 16thMarch, 2019. The machine features a combined cutterhead of 6.3m excavation diameter, and is some 107m longand 600t in weight. 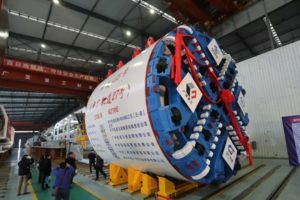 The TBM will be used to bore a 2367mlong tunnelon the Nanning Subway Line 5between Wuyilijiao Station and Xinyang Station, underpassing the Yongjiangriver. The tunnel crown is 11mfrom the river bottom and 23mfrom the river surface. The main geology along the alignment is fine sand, silt, pebbles and argillaceous siltstone, whilst on the surface the landscape is densely urbanised. CREG-GFHI-NNRTis an equipment-manufacturing JV established by CREG, Nanning Rail Transitand Nanning Good FortuneHeavy Industries, for the local manufacture and maintenance of the Nanning shield machines. As of now, ithas provided 19 shield machines to the Nanning Subway and maintained or rebuilt over 60 sets of shield machine in total whilst providing a full range of technical support services to its clients.